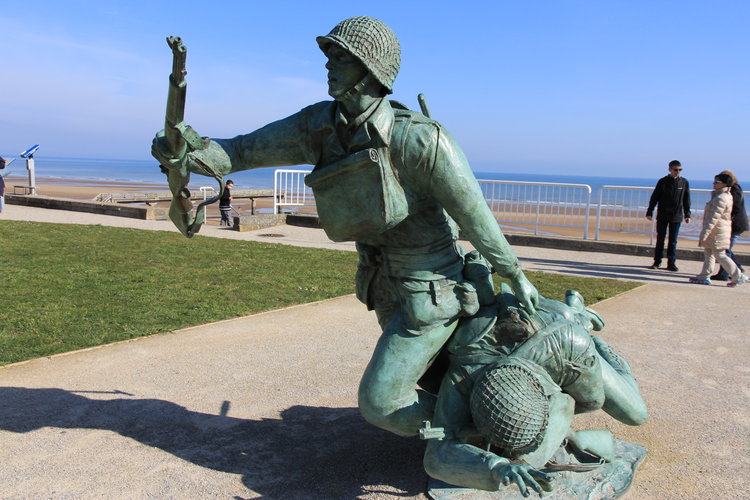 This is a fabulous tour of life in Normandy spanning 1000 years, from William the Conqueror and battle of Hastings to the D-Day invasion of the Second World War. Even though this trip is filled with the history of wars and battles, we still take the time to enjoy the quaint charm and enduring beauty of this historic area of France. This overnight trip will cover a lot of ground, starting with a direct train from Paris to the ancient city of Bayeux. We will begin our visit with a tour of the museum and the iconic Bayeux Taperstry, illustrating the story of William the Conqueror. Then it’s lunch at a local brassier, after which we do a 2 hour guided walking tour of old Bayeux and the cathedral. If you have never seen the tapestry it is important to note it is due to leave France next year and return to the UK after nearly 1000 years away. The next morning, June 26th we check out of our hotel and we are picked up at 9am for a guided tour of the D-Day beaches and the American Cemetery. We return to Bayeux in the afternoon to catch the train back to Paris. What’s included: Hotel and breakfast, train from Paris, private walking tour of Old Bayeux including medieval cathedral, private full day of tour of the D-Day Beaches and American Cemetery. What’s not included in the price: Breakfast, lunch, dinner and entrance to the museum (9.50 euros).